Visit the Cathedral Close - just moments from the High Street! On a sunny day the Cathedral Green is very popular amongst shoppers, clerical workers, visitors and more who flock to the area for a break. Others can be seen soaking up the atmosphere that the close seems to radiate. 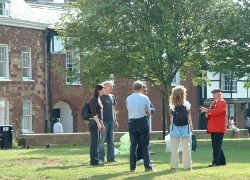 The Cathedral Close is set right in the centre of Exeter just moments from the high street. This tranquil and pleasant area with its leisurely green lawns in front is dominated by the presence of the magnificent St Peters Cathedral. Many of the building that line the close survived the blitz in 1942. These include the City Bank, Tinleys Tea Shop, Wippells and St Martins Church. 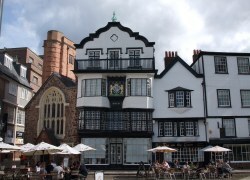 Also within the Cathedral Close are Mol's Coffee House, once frequented by Sir Francis Drake and Sir Walter Raleigh, The Royal Clarence Hotel which was the first Inn in England to be called a 'Hotel', and the Bishop of Crediton's house. Other fine period buildings in this area are now occupied by various retailers that sell crafts, gifts, books, paintings, antiques and clothing. A Roman bathhouse lies hidden beneath the cathedral's green. This bathhouse was built by the Roman Army and used by its soldiers of the Second Augustan Legion. It was excavated in the 1970's after its rediscovery and then due to a lack of funds wrapped and buried again a few years later. 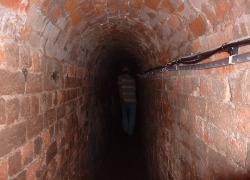 There have been several talks over the years to re-excavate the area for permanent public display.